Apologies are daunting. Most people view having to give an apology as an admittance to them being wrong and it opens them up to the possibility of rejection if the other person refuses to accept it. But what is the value of an apology? Like any relationship, it most likely benefits both parties. And in real acknowledgement, a relationship is a 2 way dynamic so it’s highly unlikely that either party is fully or completely innocent in an argument or disagreement. It does not matter if this is a work relationship, friendship, love relationship or even parent-child relationship. The value in admitting that there was fault on your side is incredible. For you and the other person, as well as the relationship. It shows the other that you’ve taken the time to reflect and for yourself, you become more self aware. Even in cases where you believe you did nothing wrong your actions obviously had an unintended consequence or impact on the other person. The mere fact that an action may have caused someone you care about pain or hurt is enough to apologise for. Especially when that was not your intention. If the relationship and the person are both valuable in your world and a simple acknowledgement could fix and possibly improve both, then why not? And this is where you as an individual would benefit too. The question then really becomes, why not apologise? Ego? Pride? Fear? I used to struggle with apologies because I thought it would be informing the other person I was admitting to being stupid; and I have a big ego so nope that was not an option. I also thought the person may hold it against me forever. But I’m learning that apologies go a long way in taking away pain you may have caused unintentionally and they don’t cost much. Plus my ego can do with some humbling every now and then. Keeps one grounded. I also struggle with apologies for fear of rejection. What if the person doesn’t accept my apology? What if it doesn’t fix anything? And the answer is that’s okay. Maybe the person isn’t ready to hear it or maybe apologising in words isn’t quite enough but you’ve opened the door and that’s a good step in the right direction. 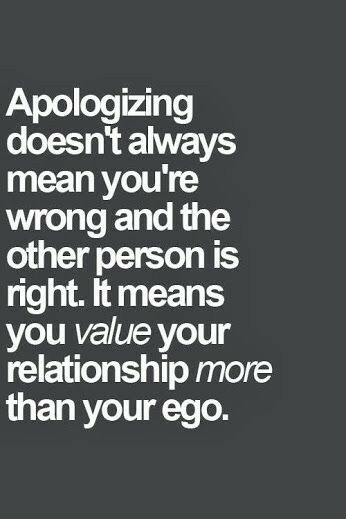 Putting aside all the obstacles that get in our way of apologising, there is one main reason to drive us to apologise and that’s the value we place on either the relationship or on the other person. Trust has an opportunity to be repaired and the relationship receives another chance to flourish. We can only learn from these opportunities if nothing else.